Sorry, I meant wedge. I ve made a mistake here spelling the name. What i mean by that, is moving around the bombs easier with a wedge, than the configuration I had in the example above. I don't think that the bomb structure matters in this case. 2 miners + 1 other piece almost always win against 2 top-rank pieces. Edited by TemplateRex, 02 January 2019 - 01:08 AM. That blue captain never goes to those three squares. He turns the corner on the 7th rank, going from I7 to H7 to G7, etc. There's no way the red major catches a thing unless blue makes the mistake you describe. Hi mogi in general double bombs next to flag is not the best choice for flag defense you want to usually put a miner seargent luit next to flag. Obviously you have to switch it up sometimes but for general ranks this is fine. Also try placing flag under the lake instead of the middle lane so you have an easier time not getting pinned and such which is a big fault with a middle flag. Or at aleast a corner and make sure to defend against a blitz on that side and u should he fine regarding flag. 2 strong pieces vs 2 miners is usually a loss, but if one of the miner is still in the opponent's field you may force a draw in the below situation. Even if you don't know where the miners are you have to guess and be lucky with your guess. Mainly miners are coming from back row or 3rd row, so it may be an indication. In the example below most likely your marsh is cornering one miner while the 2nd captain is in J6. So if you can block the miner in F7 from passing to your field you may get a draw. So move your col F3-F4. If he moves miner F7 to G7 just follow him with your col F4-G4. If he goes left F7-E7 follow him with your col F4-E4. If he moves another piece, move your col back F4-F3. Always make sure your col is in the same column as the miner, so he will not be able to pass it. If you can survive 5 minutes without game evolution you could claim for draw. Quizz: is there a parade for blue to let his last miner coming in? After 1. f3-f4 blue plays (f7-e7) 2. f4-e4 (j6-j7) 3. e4-e3 (j7-j8) 4. e3-e4 (j8-i8) 5. e4-e3 (i8-j8) red has to give up the e-file with 6. e3-f3 (e7-e6!) and the miner is diagonal. So red needs to move forward with 5. e4-e5 (e7-f7) 6. e5-f5 (f7-g7) 7. f5-f4 (g7-h7) 8. f4-g4 (h7-i7) 9. g4-h4 (i7-j7!) 10. h4-i4 (j7-j6) and the miner is diagonal again. Note that it’s best to move the captain up to the 8-th row so it won’t accidentally block the miner. what if the bomb setup from D1E1F1D2E2red is shifted 2 square on left. Instead of D1E1F1D2E2 you had B1C1D1B2C2? 1. f3-f4 (f7-e7) 2. f4-e4 (e7-d7) 3. e4-c4 (d7-c7) 4. d4-c4 (j6-j7) 5. c4-c3 (j7-j8) 6. c3-c4 (j8-i8) 7. b3-a3! (a4-a5*) 8. a3-a4 and keep chasing the miner until it finds 3 squares and then red plays c4-d3 again since the 3-move counter over c3/c4 has been reset. After every two times over c3/c4, red chases the other miner for 1 or 2 moves and resets the 3-move counter on c3/c4 again. So draw IMO. Perhaps red can also play 5. b3-a3 (a4-b4) 6. a3-b3 (b4-a4) and now 7. e4-e3 is ok again. So draw? How can the red major force the win of one of the blue captains? First of all, G8 is a bomb, Napoleon! Okay, you meant H8 for the red major. 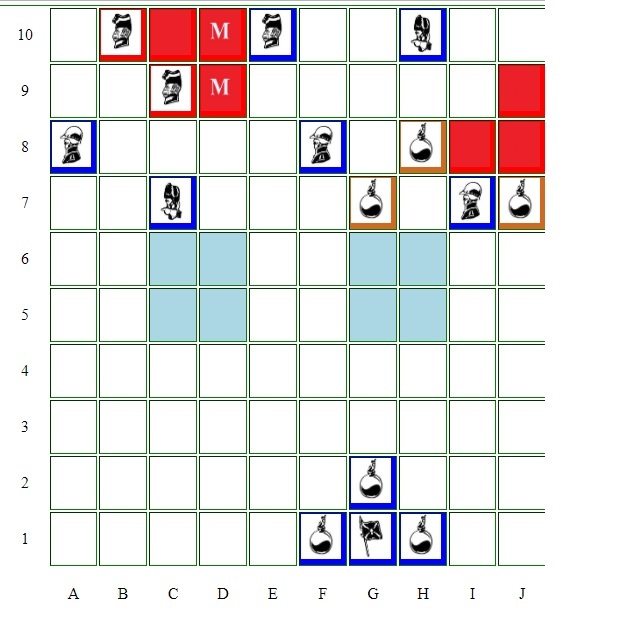 (The move by the red major to H7 forced the first blue captain to move to F7 in evasion.) 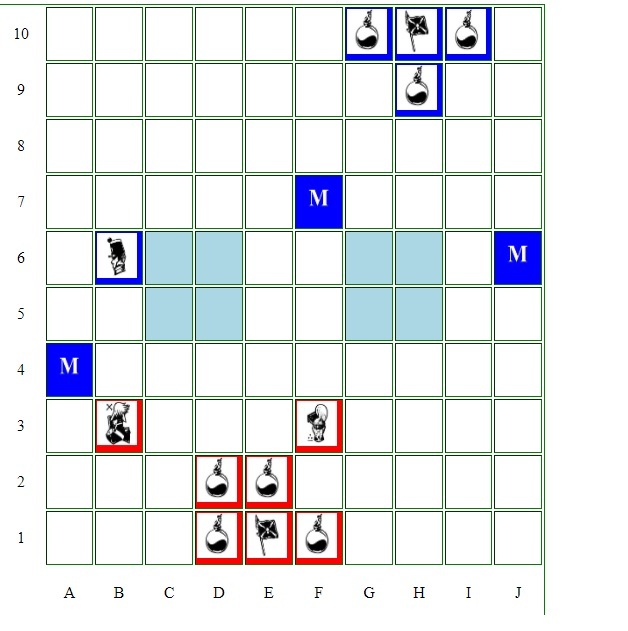 Now the red major on H7 moves to H8 and threatens the blue captain on H9. Fine. How does the major ever capture the second captain? The second blue captain will evade from H9 all the way to D9, with the red major in hot pursuit along the 9th rank. Then the second captain will move to D8 and the red major will match and move to E8. The first blue captain is safe on F7 because the red major is now chasing the second captain by moving from E9 to E8. When the second blue captain then runs away from D8 to C8 to B8 to A8 and assuming he is followed along the 8th rank by the red major both the first and second captains will be safe. The second blue captain will reach the A file where he has three squares (A8,A7,A6) to roam in and is untouchable. If red decides to pursue the potential third captain (sitting all the while on B4), then that third captain can easily turn the corner and find three squares to bounce back and forth in as well. So all captains will therefore remain untouchable as far as I can see. way into a trap of any of them, the captains will be able to elude to eternity. I don't see a trap yet. If red decides to pursue the potential third captain (sitting all the while on B4), then that third captain can easily turn the corner and find three squares to bounce back and forth in as well. So all captains will therefore remain untouchable as far as I can see. 3) D4-D3-D2: red major drives cap to D4, then goes to C4, then D4 and next move E4 again. As I wrote before: it’s not enough to just superficially glance at the board and find 3 empty squares, you also need to look for adjacent squares that can launch a new chase. In this case, the 4th captain will always be driven to D7, and a double attack on E7 is inevitable. Okay, you got me, guys. Edited by Napoleon 1er, 02 January 2019 - 10:12 PM. Now that you've shown us your quizzes, I sure hope you're not going to show us your testes. the unknown red pieces left are a lieut, 2 miners, 2 bombs and 1 flag. earlier in the game i found a bomb on F8. The piece on the left of my sergeant is obviously a miner with the lieut in D9 as he didn't capture my serg in this positin since several turns, flag is obviously in C10 (at least for the quizz we have to consider it there). Because of the bomb configuration my guess is that his last miner is sealed in in J8. red knows only my sergeant but between the 5 other movable pieces he doesn't know which one is miner and which one is scout. the game ended as a draw but question is if can I win? If yes how? Edited by Napoleon 1er, 09 March 2019 - 09:06 AM. I put this on the board, but I couldn't find a win. Not even with all blue pieces equal to a scout. Perhaps there is a tricky way to let red chase continuously and force him to let a blue piece through to the flag. Did you find a win yourself? Edited by TemplateRex, 09 March 2019 - 01:21 PM. mathematically if you can exchange your serg for a red serg your 2 scouts could bring you a win ... but how to do it? I haven't worked it all out, but I'd use the Miner at F8 to clear the bombs and destroy Red's Miner on the right side. Your Sergeant keeps the Lieutenant pinned; Red will be forced to move a Sergeant. Or, would Red try to trap the Miner at A8 with B10>A10? 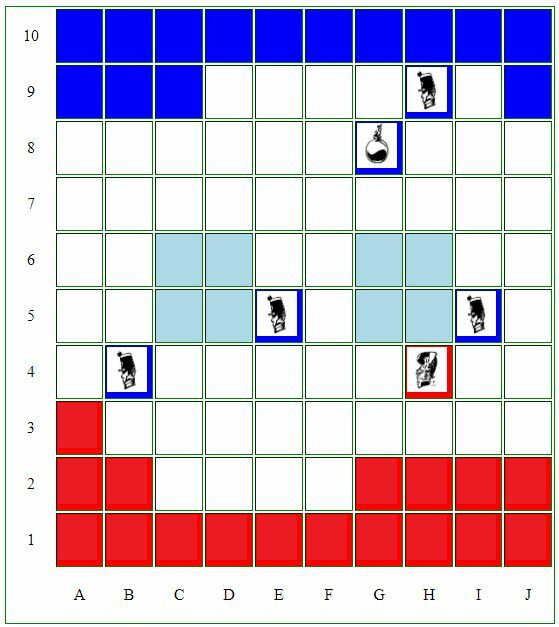 If you're Blue, if Red moves to A10, do you move: G7>H7 and allow the Red Sergeant to chase? I think so. He can't capture that Miner, and the other Sergeant can't assist b/c of the Scout. If Red starts a chase, Blue waits until he quits, then moves: H7xH8. Not sure if this can be done successfully with perfect play from Red, but that's what I'm thinking. Edited by Lord Invader, 09 March 2019 - 08:14 PM.